Taking time to focus on health and wellness can make a big difference for college students. 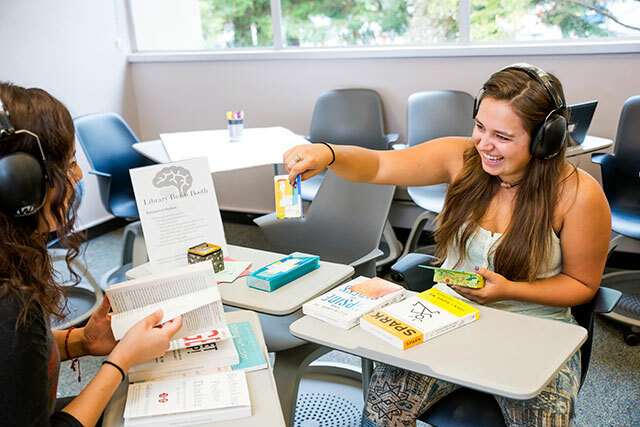 At Humboldt State, there are a number of ways for students to explore well-being, including the innovative new Brain Booth in the University Library. Students explore materials for guided contemplation in the library’s Brain Booth. With the Brain Booth, the library is encouraging students to take mental breaks, as mounting evidence indicates that engaging in quiet, contemplative activities like meditation or even coloring books can have numerous benefits. “Whether you call it contemplation, focus, or meditation, giving yourself an intentional space and time where you stop thinking makes you think better. And that’s better for physical wellness, better for emotional health, and it’s better for intellectual health,” says Librarian Marissa Mourer, who leads the effort. In an oft-cited 2008 University of Vermont, Burlington study, researchers found mindfulness and meditation may lessen anxiety and improve academic performance among adolescents with learning disabilities. 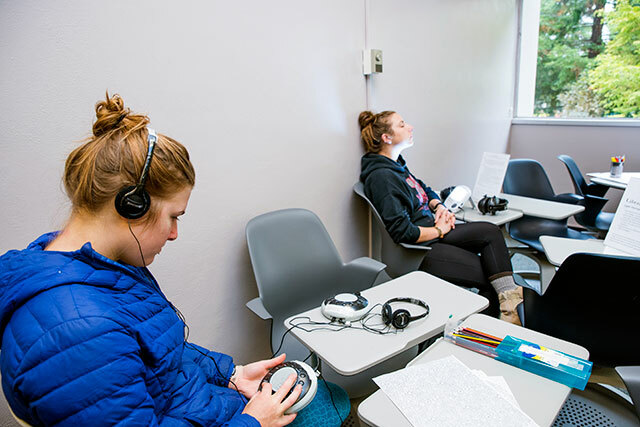 Students use light and audio therapy in the library’s Brain Booth. Similarly, a 2010 study published in the Journal of American College Health found that engaging in mindfulness helped college students regulate their moods and stress levels, which led to improved sleep. The American Academy of Sleep Medicine has long held that a lack of sleep can hinder grades and learning skills, so taking a little time out each day for quiet contemplation can have major benefits. With the Brain Booth, the HSU Library wants to see if those effects can be replicated among HSU students. Dozens of students make use of the Brain Booth every week and feedback has been positive. “What students keep telling me is ‘we need this,’” says Mourer. The booth, actually a pair of classrooms in the library, features a small fleet of FitDesks—exercise study bikes that allow you to pedal while using a laptop—biofeedback machines for tracking vital signs, sound machines, noise-cancelling headphones, and, yes, coloring books for grown-ups. Students are encouraged to explore the Brain Booth and find mindfulness methods that appeal to them. “The Brain Booth is a drop-in, hands-on experiential lab, so we want students to explore the positive impacts that taking an intentional brain break can have on their academic success,” says Mourer. Libraries have explored ways to bring contemplation and mindfulness to their patrons in a number of ways, including hosting guided meditation classes or “de-stressing” sessions during finals week. Still, other libraries build media collections around contemplative pedagogy, but, according to Mourer, HSU’s approach goes one step further. “I didn’t see any single library putting everything together with the idea that we also need to share the knowledge and research with students that there is scientific evidence showing that taking a brain break can actually actually make them better learners,” says Mourer. The Library Meditation room is open to all HSU students, faculty, and staff Monday through Friday, 7:30 a.m. to 8 p.m.
For more information, visit http://libguides.humboldt.edu/brainbooth.